Are you a right brain thinker or do you use your left brain? Which do you think makes you a better leader? 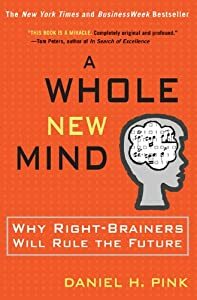 My book club is currently reading Daniel H. Pink’s book, “A Whole New Mind”. The book explores the strengths and skills of leadership from the perspective of left and right brain skills. It looks at what was needed in the past to be a successful leader and what is needed now. To date, our leaders have leaned towards left-brain thinkers. MBAs and lawyers who could crunch numbers and construct contracts, but he argues that the time is right for new kind of leader. Those of a more creative bend, those capable of recognizing patterns, telling stories and a generally more inventive frame of mind. Pink suggests that in times of abundance humans begin to look for more meaningful ways of defining success. The basic premise is that that if you are living in a time of abundance (which many of us are in North America and Europe) then you start to wonder about different things. You start to aspire to achieve more emotionally complex goals. In essence, you move up Maslow’s hierarchy of needs to focus on self-actualization and start to think about other, more emotionally charged means of reaching satisfaction, success or happiness…depends on your personal target. I might have scoffed at that thinking a little, but I just spent the last two weeks reading a variety of blogs about finding happiness, managing emotional vampires and getting past the “aaaarrgggghhh” moments in our lives. It seems Daniel Pink might have a point about where we are in our economic and emotional development. Our definition of what defines success seems to have become more complex. Simply having a job or even achieving monetary success is no longer enough. We need to have a deep-rooted satisfaction with the work we do. The blossoming blogosphere, the emergence of countless freelancers, our praise of entrepreneurial spirit, our insistence on visionary leadership and an emerging interest in working from home all speak to a desire to lead more independent and satisfying lives. We’re looking for control and to be part of something better. Could Daniel Pink be right about which side of the brain will make for a more effective leader in today’s environment? Do we need bosses who know how to be responsive to our more complex emotional demands? Leaders, who can think outside of the box, be holistic and intuitive because not only is it what workers are looking for, but may also be what the work we do increasingly requires. The use of automation and less costly workers means that jobs in the first world are more complex and require a different level of thinking. Couple that with our preoccupation with self-actualization and it makes sense that we need a different kind of leader…or does it? That assessment makes sense to me, but beyond that comes the big elephant in the room, the brain function itself. While we often hear about the two sides of the brain as having distinctly different functions, they are not quite that easily defined. Much more research is still required. So for the sake of this conversation lets simply consider that the skills we have traditionally seen as strengths for our leaders may be changing. What do you think? Do you think we need more right brain leadership? Do left-brain thinkers still make for better leaders? Is the whole conversation of what drives us even relevant? Are we solving more complex problems in our jobs? Are we aspiring to more complex goals? Want to test which side you use? Follow the 3rd link to, “Instant Personality Test”, it’s quick though I can’t speak to its accuracy. I could only see the girl turn clockwise…No matter how hard I tried I couldn’t make her turn anti-clockwise. Right brain characteristics seem to fit me…so there might be some truth to this test! And yes we are all moving towards more harmony and contentment – years ago I would have settled for any job but today it has to be something that I’m passionate about or something that gives me a deep satisfaction – it’s no longer about just the money. I agree. You need money to pay your way, but it can’t be the driving force behind decision making or you’ll just end up miserable. Thank you Akhil. I quite like the idea that we don’t need to find leaders, but need to think effectively ourselves. If we’re all using our minds more effectively the need for deep direction from leaders starts to disappear. I think it interesting that until we pose the question, which set is better, how often we accept that one set of skills is all that’s required. Without self-reflection we all get a little lopsided. The role and temperament of the new leader can’t be all left brain anymore. The top-down style of management that ignored the right brain is passe. The new leader requires empathy and and the willingness to engage with employees, especially Millennials for whom that engagement is essential. Top-down management never worked, in my opinion. The stars of the organization simply left. I have to agree with your assessment of the top down approach. I’ve seen valuable people drift away when organizations couldn’t embrace the idea that folks at the “bottom” might sharper insight into the needs of customers than those at the top. Although the conversation around the generational divide is prevalent, I think no matter where you are on the demographic scale, balanced leadership will be popular with everyone. It’s so true, we need to exercise both sides of our brain. As someone who’s studied music, I can tell you that it requires both math skills AND creative skills, so you’re using all of your noggin when you play or write a song. I don’t have time now to take the test, but for sure will come back and see where I stand! Thanks for this intriguing post. First things first. The woman is turning to the right, therefore clockwise, and so perhaps you could consider me to be right-brained. However, I have taken several psychology tests, and I am middle-brained (I use both sides equally). This makes sense, since I love math (left) and English (right) equally, and have taught both of these subjects! Secondly, leaders should use both sides of their brain to be optimally effective. The twirling lady made me dizzy 😉 In all honesty, I’ve spent most of my life liking to think I’m bound for supreme creativity, but many ways, I am more left-brained than right-brained. Like most things in life, it’s possible to train one’s self to improve in the areas they are lacking in. My problem always comes from being able to see both sides of a coin simultaneously. I often get stuck in pondering mode and don’t see things through to their entirety. It would be nice to see creative thinking fostered more in our school systems. I like that idea of training your brain to be effective on both sides, it gives us all hope. Although I also like to think of myself as a very creative person, when you put me into a chaotic work setting I’m the first person to start creating processes to bring things into order. I find the absence of creative arts in the school system so sad and shortsighted. When I was growing up in Quebec, creative classes were integrated into school. We did everything from pottery and ceramics to wood working and visual arts. There was a band and a drama club. Everyone had to try each class for several weeks at least. When I had kids I was a bit dismayed that the same variety of creative classes wasn’t available. In the end, I looked for what they were drawn to and put them into private classes (music, art etc.) that would help them grow those skills. Whatever they eventually decide to do, I think its important that they exercise both their creative and logical selves. I can only see her turning clockwise so I must be a strong right brainer. Does that jive with how you think about yourself? I’m curious about whether there is any validity to the test. I agree with Daniel Pink, Simply having a job or even achieving monetary success is no longer enough. We need to have a deep-rooted satisfaction with the work we do. I can relate to this comment. I sold real estate for 25 years. Each year the company had a contest of the top producer in the office. Mind you this award meant nothing in monetary success, it was the recognition and feeling of sanctification on getting to the top and doing a great job. I had earned this award and my manager said I can’t give you this award as it has always gone to Sandy. Actually it was the best thing that happened to me as in the moment I decided to quit and start my own business. Today I try to have a balance of both types of thinking. I agree Susan. Although I often have a bias towards one more than the other, that’s a personal bias, I would be unwilling to focus professional decisions solely on one without giving consideration to the other. She turns both way for me. If you look to the left of the picture she might begin turning right for you and if you look right she might begin turning left. Or hold your eyes to one side or the other and you might she her flip back and forth. By looking directly at the picture depending on brain dominance it will spend more time going one way vs the other. Another test is to clasp your hands together without thinking (where the fingers are interlaced and palms touching) then note which thumb is on top. If your right thumb is on top then you are left brain dominant and vice versa. Brain dominance typically doesn’t change, but we can be more whole brain functioning by doing integrative activities. Brain dominance is where the information gets routed first. But our decisions and behavior can be whole brained. I like the thumb trick. I’ll try it a few times to see what prevails. :) I would imagine that most humans have to use both sides of their brains or they wouldn’t be able to function well, but it’s interesting to speculate about what is more popular and what it says about us. Janet you’re so right. In business, like in most aspects of life, balance is central to success. To assume that one style or approach is better is paving a path to failure. I think the challenge we all face is knowing ourselves well enough to know what our tendencies are and periodically making the effort to go against our instincts. Personally believe leaders should use both sides of their brain. Pink is, more or less, correct when it comes to leadership in the West. But don’t forget that approximately 84 percent of the population in the world live outside the West. Countries like China, India and Saudi Arabia are now moving up Maslow’s pyramid. Unfortunately however, a section of the population in Europe and the US are moving down. Abundance is moving to other parts of the world. How will that affect leadership in the West? Will authoritarian leaders become more common? Read in The Financial Times recently that a professor is certain the world economy will crash again. And he believes it will be the Eurozone. Great point about the North American bias. Shift the perspective and the conversation changes with it.It should be interesting to see what very different cultures do once they reach the same point of abundance many of us in the west are currently experiencing. Looking at the reverse, the Occupy movement that dominated so many public spaces around the world may give us some indicator of what happens when that abundance starts to disappear. In many cities the authorities eventually moved in to remove the occupiers…hmmm, does that indicate a shift towards more authoritarian leanings? Time will tell. The Occupy movement is a good example of what happens. By the way, in some cultures in the world the violence will be horrendous when they have reached abundance and it disappears. I am in the middle of a book called “you are not as smart as you think” which has a chapter on left/right brain communication (a bit off topic sorry). What is amazing is how the two communicate and if you cut that, like they do in extreme epilepsy cases, then you get some crazy side effects. Our brain is a complex and amazing beast, and pure left or right sided is not possible. The work together more than we can imagine! But back on topic – I am for more creative leaders! I love the “off topic” bit. 🙂 Understanding the way our brain functions is fascinating because it provides us with some terrific insight into how our minds work. It’s that neat space where biology and personality mingle. In short, I believe we need both types of leaders. Just as the way various situations call for different approachs , every person and/or organization needs various perspectives and supports to be successful. How many times do we hear that a successful leader is being replaced due to the circumstances of the organization they are leading? Sometimes a linear, factual leader is needed to guide an organzation through some tough economic times. Other times, the same organization may need a more thoughtful and innovative approach to build an organization of forward thinkers. As with anything else, it takes all kinds to make a well rounded world. I don’t think leading is any different. Its funny how often we like to simplify things. I know that it makes it easier, but it doesn’t always make a lot of sense. I’d be very uncomfortable working with anyone who could only see things one way.